Froneri, Nestlé's ice cream joint venture, announced in October its intention to close yet another former Nestlé site, the factory and research centre in Beauvais, France. 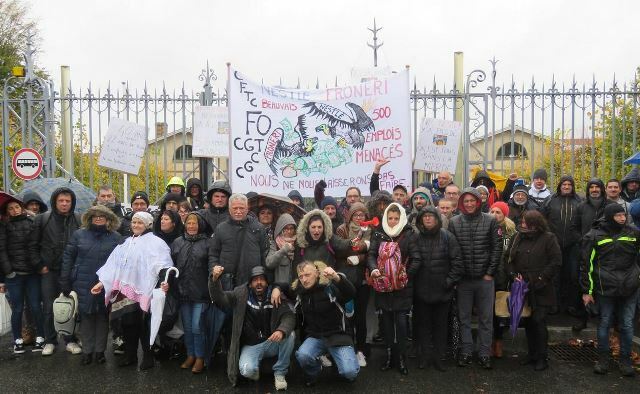 The unions represented at the Nestlé-Froneri factory in Beauvais (the 3 IUF-affiliated unions FGTA-FO, CFTC, CFE-CGC and the CGT) have reached a settlement for the 317 workers which will provide a decent foundation for their future. In addition to their statutory premiums, workers will receive a payout of up to 75,000 euros (for those with over 9 years of service). Early retirement schemes will be available for workers who are 56 years old or older, providing payments for 5 years well above the legal provisions. To increase pressure on management to negotiate in good faith, workers blocked access to the factory for 5 days beginning on 28 November. Negotiations on behalf of the 75 workers at the research centre are still ongoing. The final agreement should be signed in January. On 2 November, workers from Beauvais demonstrated at Nestlé France head office near Paris.